Tans have a distinctive coat color earning them references to a Doberman‘s coloring. They are available in 4 colors: black, blue, chocolate and lilac. The original color was black. 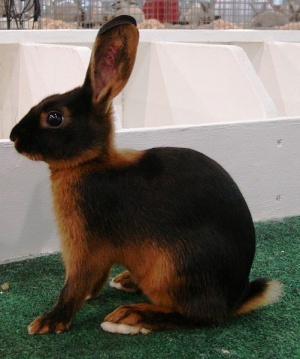 Markings are a bright tan triangle on the neck, the ears, inner part of the legs, feet, chest, belly, flanks and underside of the tail. Does weigh 4-6 lbs., bucks are 4-5 1/2 lbs. Life span is 8-10 years or more. Tans are very active and intelligent and require exercise. 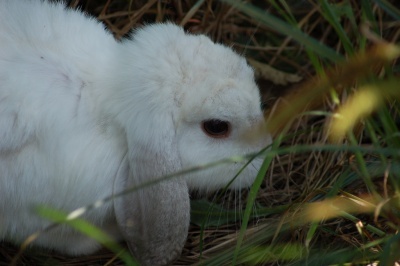 Rabbit-safe toys can be provided to keep them occupied. Don’t allow a Tan to roam far from its cage without supervision. As with all rabbits, any area they occupy should be made rabbit-proof. Tans are very friendly, making them good pets. 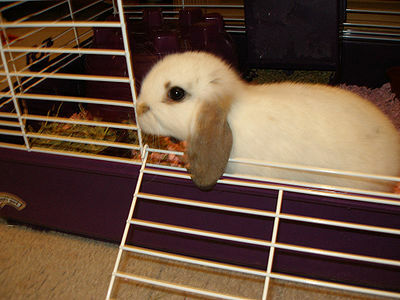 Cages should be secure because Tans are capable of learning how to open them.